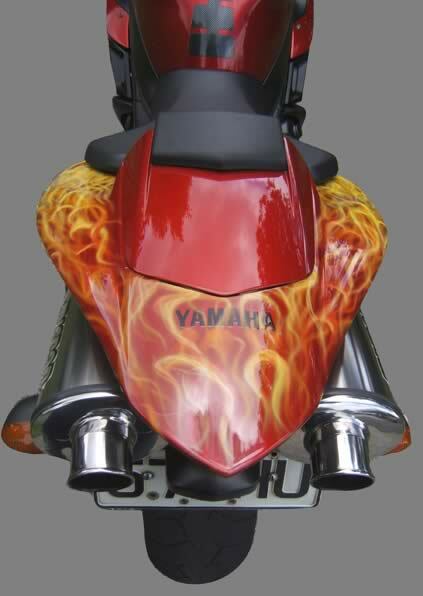 Anthony is a Harley riding truckie who hunts and he wanted images of deer created out of the smoke from a cartridge shell..
Shane wanted his two youngsters portraits on the fairing with "real flames" coming off the front, to show the passion he has for his family. I did the portraits in silvers and the flames just glow over the Cobalt Blue base colour. He loves it!!!!! This Rotorua AC DC fan wanted the bike world to know of his passion for the Lads!!! 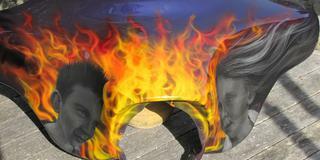 Auto Restorations (Rotorua) painted the amazing PPG Vibrance Candy red and I airbrushed all the AC DC images!! 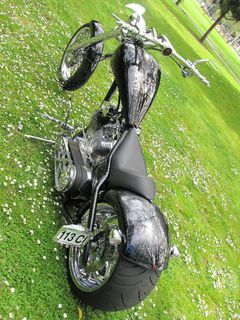 Built at Bat out of Hell Bikes, Whakatane, for Kiwi , now in Aust, Cheyenne..His ideas for artwork and colours mine for layout and graphics..PPG Candies, "marbleiser", base coats and Clear. 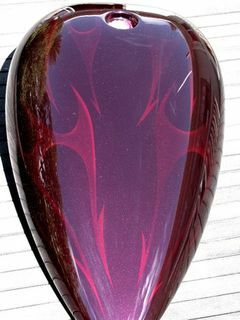 Nick wanted tribal ghost flames on his Chop..colour had to be real dark plum ( black look till sunlight works the Plum flop with ghost flames appearing)... Beautiful PPG Vibrance colour by Auto Restorations, Rotorua. 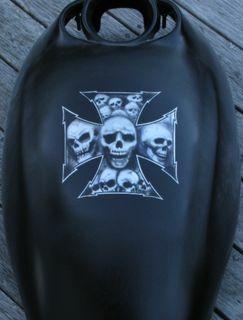 Rod wanted a Maltese Cross with Skulls on his Harley V Rod tank skin.. also cleared with Harley matte clear. Here it is!!! 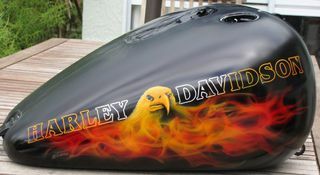 Airbrushed this Trike for the Lovely Kerry from Taupo NZ. 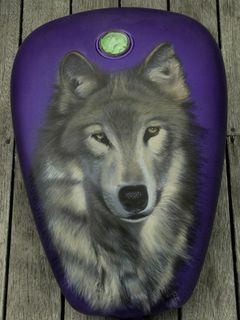 She is nuts about Grey Wolves so that was the chosen theme. Mike wanted really subtle but striking paint artwork. We decided to cobweb the bike and have Katipo (NZ Redback) spiders breeding on it. A guy is trapped inside the tank trying to get out through the web and large spiders on front and rear guards. 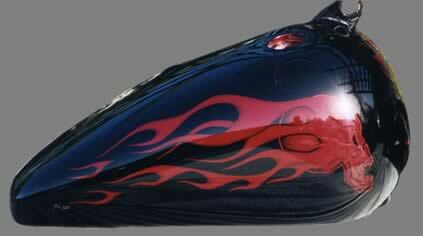 Herbie wanted a standout realfire look with flames coming from skull, skeletal hands holding aces on tank. He also wanted skull and fire demons in flames on both guards. Tony wanted his Harley Sportster to have a different look but relatively subtle and "old timey" with red scallops with white pinstriping. His comments- "better than what I imagined"!!!! Thanks Tony, enjoy the rides!! 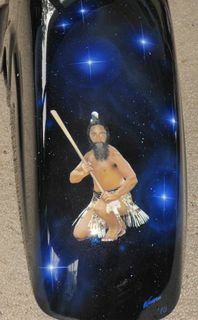 Mike asked me to do a portrait of him doing a "Powhiri" ( Maori Challange ) in front of the sacred Maori star group "Matariki" ( Pleadees )on the front guard of his newly built Trike, and to airbrush star images on the rear guards. The seven stars in the group represent his seven children, and the powhiri is representative of the strength of his Maori cultural heritage. The image of Mike is only about 100mm (4in)high so was quite a challenge, but a very satisfying one, for such a nice guy. Tank and guards Base coats sprayed in DuPont Black with red pearl base by Craig 'Haggis O'hanlon. All artwork - Eagle and 'realfire' all freehand and loose stencilling in my studio. Stencil used for lettering - NO Stickers!! Stutty has had this chopper for some years and is doing a total rebuild. 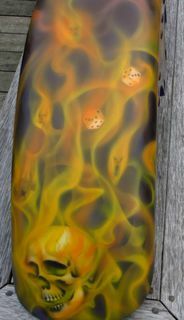 So he got my little bro Craig to spray the orange base colour and 'flake and then it came to me. 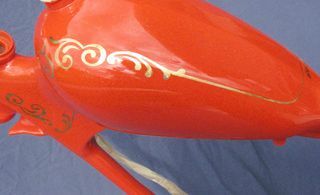 He really wanted a retro look so we went for gold leaf pinstriping, something I used to do a lot of in the 1970's. It's a time involved process but the results are well worth it. Showing woodgraining and metal brackets and "repairs" using "wire, nails, and screws" to "crack"